The future will require some work. 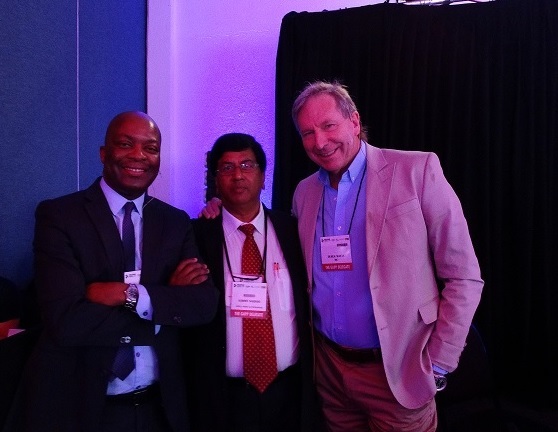 This was the general outcome of The GAPP Conference in Association with Nashua, which was held at the Propak Africa show on 16 March at Nasrec. Speakers from the political, economic and industry sectors all addressed the fact that there are difficulties which lie ahead but that those difficulties can be overcome with the right attitude, participation and forward planning. Sponsors of The GAPP Conference included Nashua which was the Associate Level sponsor and co-host for the event, Konica Minolta South Africa, Kemtek Imaging Systems, Hi-Tech Inks and The SA Print Directory. The role of master of ceremonies was carried out with consummate professionalism by Derek Watts, well-known television presenter and award-winning journalist. The conference was opened by Sentient Publishing Managing Director Vikesh Roopchand who welcomed the guests, thanked them for their attendance and then thanked the sponsors and the speakers for their participation and contribution in bringing the valuable information to the local printers, signage manufacturers and packaging suppliers. The keynote speaker, Justice Malala, addressed the political situation in South Africa focusing on the current events and how they will impact and influence the future. His presentation entitled ‘Beyond the Noise – South Africa political trends 2016 to 2026’ clearly showed just how intertwined the economy of the country is with the political situation. He addressed a number of relevant issues including GuptaGate, the Nkandhla debacle, the situation around the finance minister and the upcoming municipal elections. Delegate comments included, ‘Good, level-headed overview of our political landscape,’ ‘Unbelieveable speech and an incredibly dignified and knowledgeable person. I was transfixed from the moment he started speaking until the end’. The second speaker of the day was by Mike Horsten, General Manager of Marketing from Mimaki Europe, who spoke on opportunities presented by large-format solutions for the growing market sectors of textile printing and packaging production. His presentation entitled ‘Digital Packaging and Textiles is not a waiting game it’s on today’ focused on applications which printers or packaging manufacturers can look at as potential areas of growth for their companies. Attendee comments included, ‘He was quite entertaining and thus engaging. He delivered quite a lot in a short time frame’, ‘A good opportunity to understand the SA market and to do something different’. Linda Jackson spoke on the things that packaging printers need to know in order to be able to print for food-based packaging. While the packaging sector is clearly a market experiencing strong growth, there are a number of laws and regulations controlling what can be on the packaging, both in terms of the types of inks and chemicals used, as well as the information that can or must be displayed on packaging. Delegates commented, ‘A very informative and well-presented presentation’, ‘Informative. Highlighted how important the food label is in our life’, ‘What an eye-opener. We don’t take notice of what could harm us and our families’. The first presentation after the lunch break was from Laurel Brunner a UK-based industry journalist and industry analyst. She informed printers on best practises to ensure that their companies are able to weather the changes which have impacted the printing industry on a global basis. She explained that print definitely has a future but that in order to make the most of the industry, printers will have to adopt an intelligent approach to their businesses. Comments included, ‘Informative, well-researched and well-delivered’, ‘Great talk, Consolidated what we know and what we should be doing’, ‘Although not the easiest presentation to listen to, the context was interesting and a big eye-opener’. The final presentation of the day was from South African economic journalist Alec Hogg whose speech ‘Tap dancing in a warp speed world’ looked at the current economic situation and how things could be expected to progress in the near future. He too drew a clear link between the political situation and the impact on the economy. He also showed that a number of factors need to work together in order for the economy to stabilise. The question on everyone’s lips at the time was whether the international ratings agencies would downgrade South Africa’s fiscal status and unfortunately it seems that there is very little of chance of this being avoided. Delegates commented, ‘Very interesting global and local overview in a snapshot’, ‘Good presentation, encouraging us to believe in ourselves and strive to work hard every day’, ‘Interesting to hear about where our economy is potentially headed and what we can do to thrive in the current economy’. The response from delegates to the presentations was overwhelmingly positive, given the broad range of topics and market sectors there was something for everyone.